I have discovered so much about myself since I became a parent. Most of what I have learned has been reflected back to me by my kids. I will hear my three year old say something funny and wonder where he heard those words. It’s jarring to discover that he picked up that turn of phrase from me! I had no idea how many times I used the word “actually” until my kids started adding it to their conversations. Actually, as they have gotten older they have progressed from mimicking our words to mimicking our activities. Last weekend I heard the door slam and knew my older boys were going down to the horse barn. I continued helping the younger kids with their boots and chaps. Seconds later the door flew open and my oldest son sprinted through the house, ran to his room, then ran back out again with something in his hand. And slammed the door. Again. Yep, it was a snake. A fairly big one from what I could tell in the picture. I asked my oldest boy if he knew whether it was a rattle snake or a bull snake. 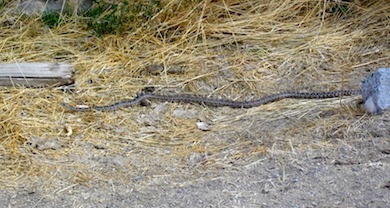 He quickly assured me it was just a big ol’ bull snake. Yep. 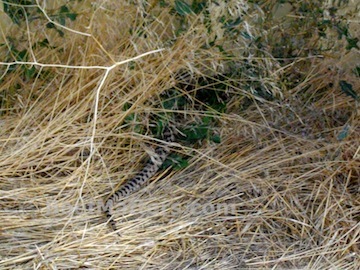 Definitely a bull snake. I had to laugh. He was right, I am happy to have his pictures. But, I might need to re-think my parenting style and remember to teach him a few basics. Grab the shovel first, then the camera.